Warren Buffett, chairman of Berkshire Hathaway Inc., arrives for a BYD Co. press event in Shenzhen, Guangdong province, China, earlier today. 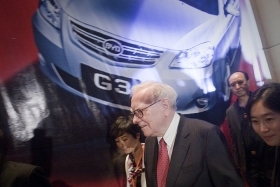 SHANGHAI (Bloomberg) -- Billionaire Warren Buffett today affirmed his support for BYD Co., saying the Chinese automaker part-owned by his Berkshire Hathaway Inc. holding company will be a leader in selling electric cars. Buffett’s visit comes after BYD declined 19 percent this year through last week in Hong Kong trading. BYD’s sales dropped 19 percent in August and the company has said it may fail to meet a schedule for delivering electric cars to California. The stock surged 4.3 percent today as the carmaker said it has signed 30 dealers to market the F3DM plug-in hybrid car in 20 Chinese cities. BYD, founded as a battery maker by China’s richest man, Wang Chuanfu, entered the automobile market in 2003 and began mass production of the world’s first plug-in hybrid five years later. The carmaker plans to start selling the E6 electric car in the U.S. this year and in Europe next year. Buffett, speaking to BYD dealers in a crowded hall in Shenzhen, said he was impressed with the E6 after test-driving it in May. Berkshire Hathaway owns 10 percent of the automaker through its Midamerican Energy Holdings, based in Des Moines, Iowa. The E6 will take six hours for a full charge and will run for more than 300 kilometers (186 miles) per charge in cruising mode, BYD said Sunday. The first electric E6 taxis began serving Shenzhen in the first half of the year. BYD is banking on electric vehicles and plug-in hybrids as rivals such as General Motors Co. and Nissan Motor Co. introduce new models in China. The country, the world’s biggest polluter, is offering buyer incentives for fuel-efficient vehicles to help cut emissions. The government said in June it would offer as much as 50,000 yuan ($7,473) toward the purchase of plug-in hybrid models and up to 60,000 yuan for vehicles that run only on batteries in five Chinese cities on a trial basis. China may subsidize purchases of at least 4 million energy-efficient vehicles by 2012, the National Development and Reform Commission, China’s top economic planner, said in June. The dealer arrangement announced today for the F3DM hybrid extends opportunities beyond Shenzhen, the only place the car is available now. It will retail for 119,800 yuan after the government subsidy. The automaker delivered 48 F3DM cars in 2009 at 149,800 yuan apiece. In the first nine months of the year, it has sold 183,629 of China’s best-selling car, the gasoline-powered F3, which costs an average of 70,000 yuan. BYD declined to disclose how many F3DMs it had sold this year. The company also announced plans today to build an energy storage factory with China Southern Power Grid Co. to expand into what BYD calls its “new energy” business. BYD signed a cooperation agreement with Spain’s Endesa SA on Sept. 25 that includes testing small and large-scale battery storage systems.